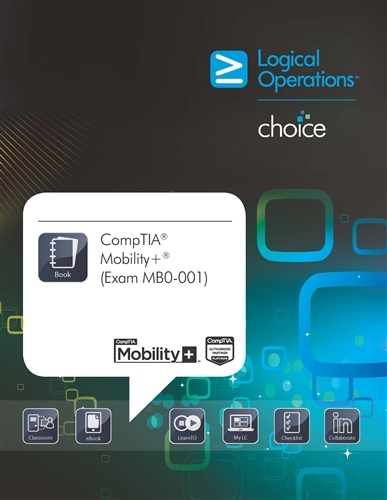 LogicalCHOICE provides traditional courseware (recognized with the most perfect 5.0/5.0 scores from ProCert Labs) that is integrated with electronic components accessible through a tile-based learning delivery platform. The electronic components are designed to enable anytime, anywhere learning through a variety of mediums. Electronic components include an e-Book with supporting student data files, "LearnTO" video content that reinforces and expands on key content within the book, "Checklists" for on-the-job reference of key procedures and tasks, an "Assessment" question bank for gauging comprehension of material, and LinkedIn and Twitter communities for peer-to-peer interaction on course material. This product will prepare students for the CompTIA Mobility+ (Exam MB0-001).